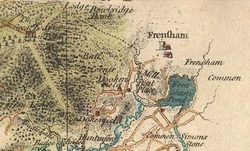 In 1706 there is record of a legal case over the disputed ownership of the river supplying the mill between the manor of Dockenfield and the manor of Frensham Beale. The mill had two mill ponds to ensure that the corn mill had a constant supply of water even if the main river supply ran low; one of which was built on a small Wey tributary carrying runoff from Frensham Great Pond. This large pond feeds into the Wey about half a mile above where the mill was located.